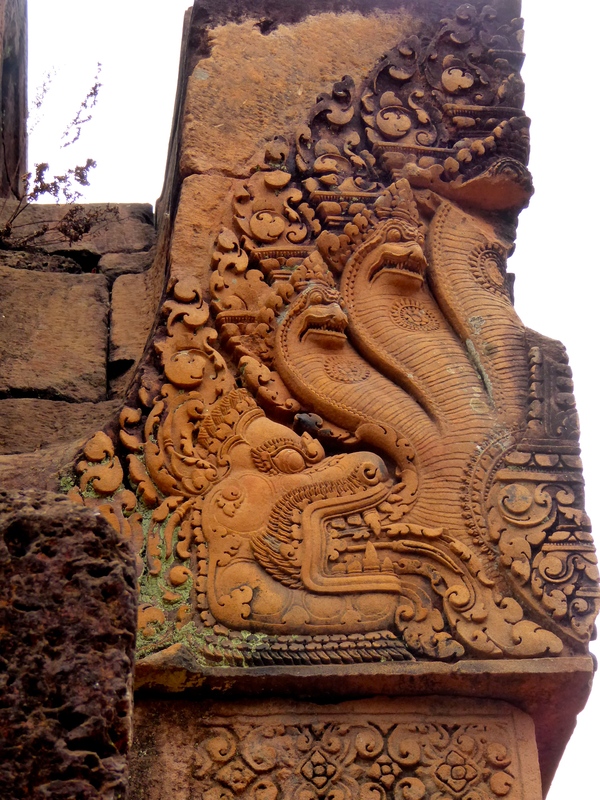 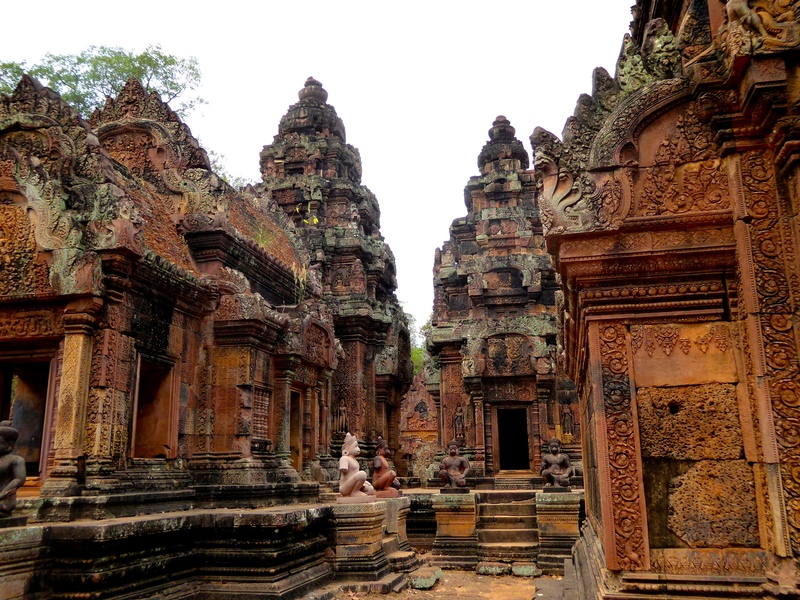 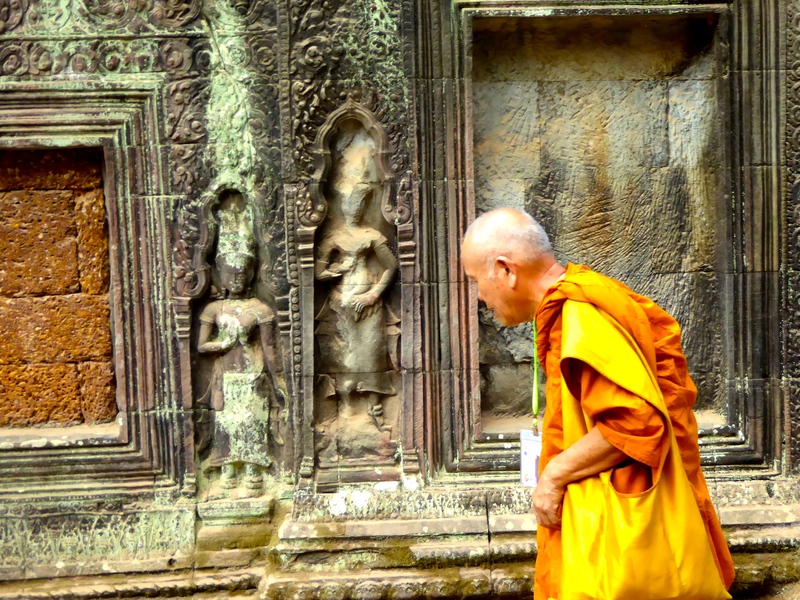 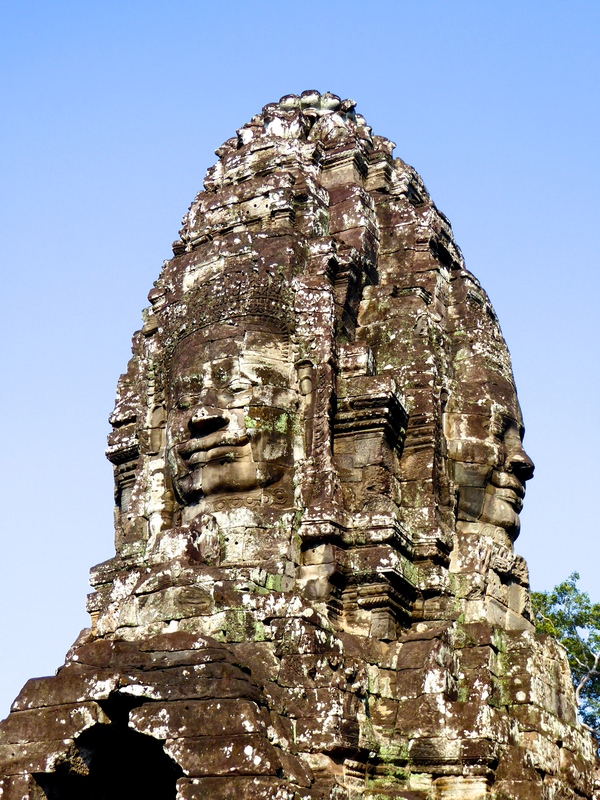 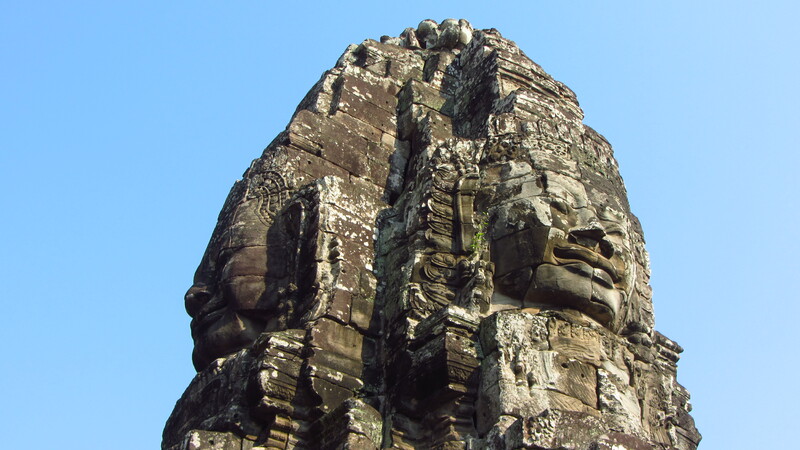 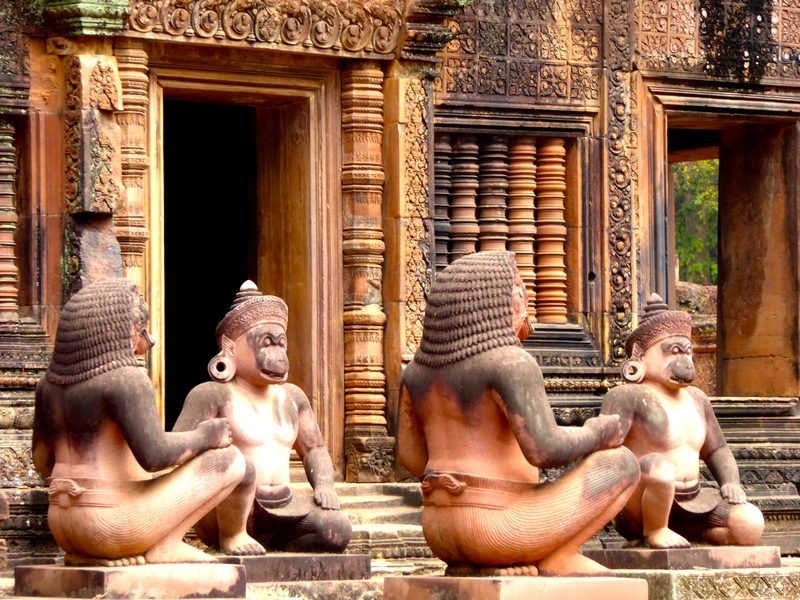 Within the Angkor park complex in Siem Reap, Cambodia, there are many other temples. 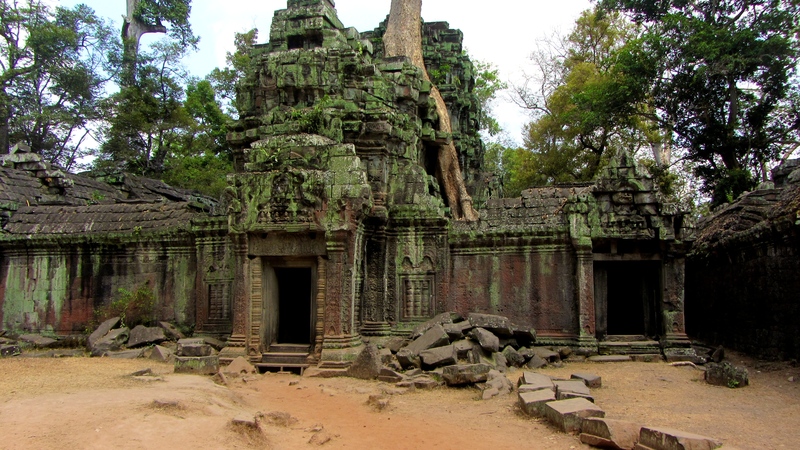 Aside from Angkor Wat, Ta Prohm and Bayon may be the best known and the most photographed of the “other” Khmer empire temples. 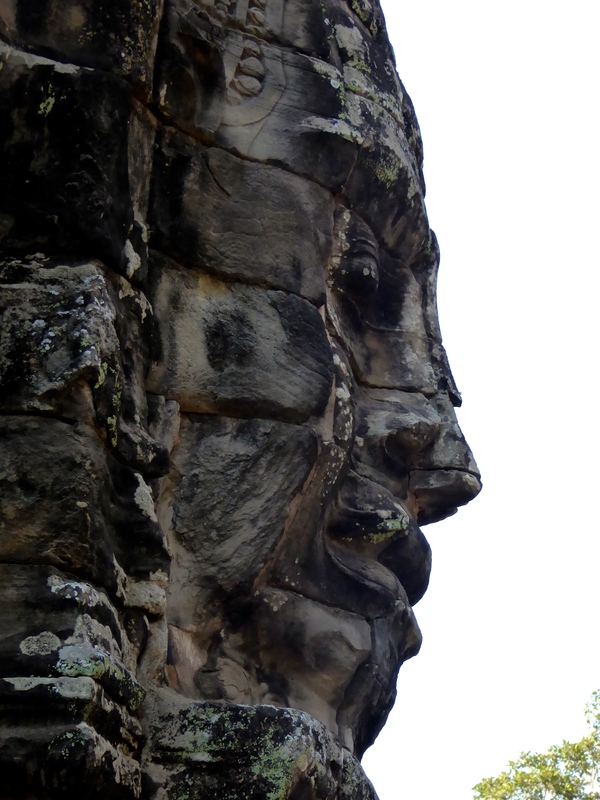 Ta Prohm is popular because of its location within a semi-cleared jungle (very Indiana Jones feeling), whereas Bayon is famous for its huge enigmatic, carved stone faces. 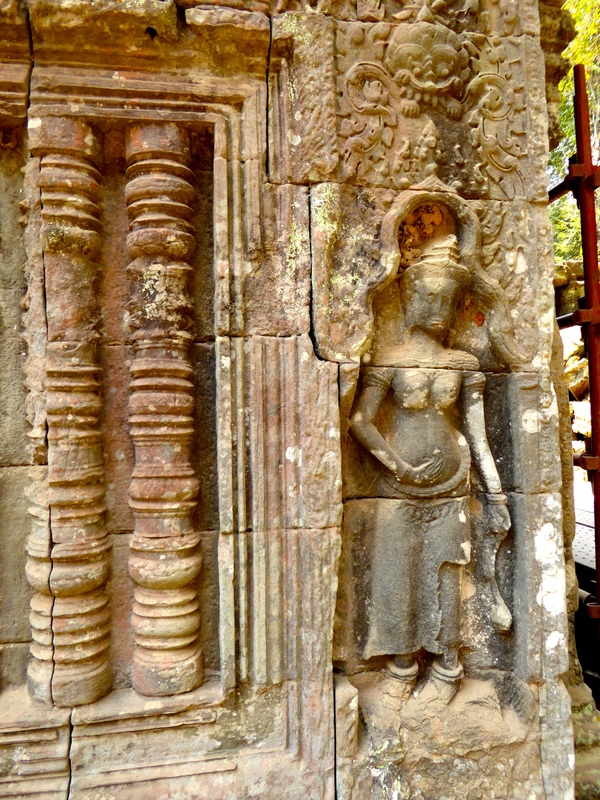 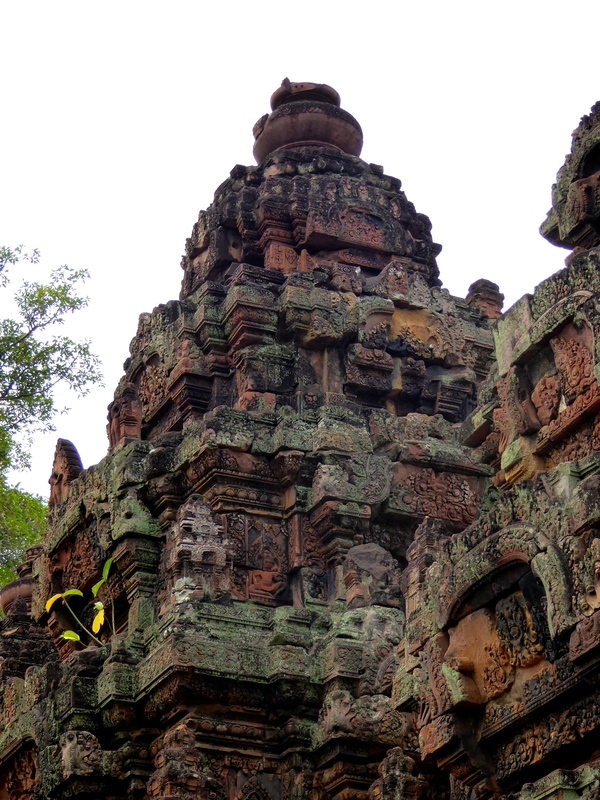 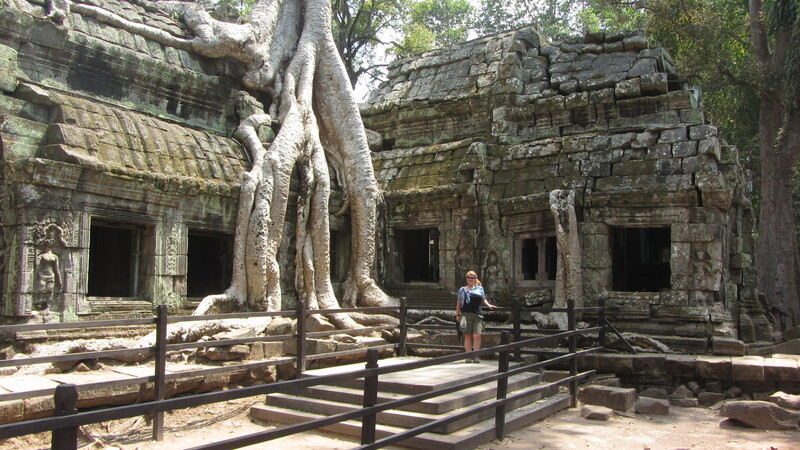 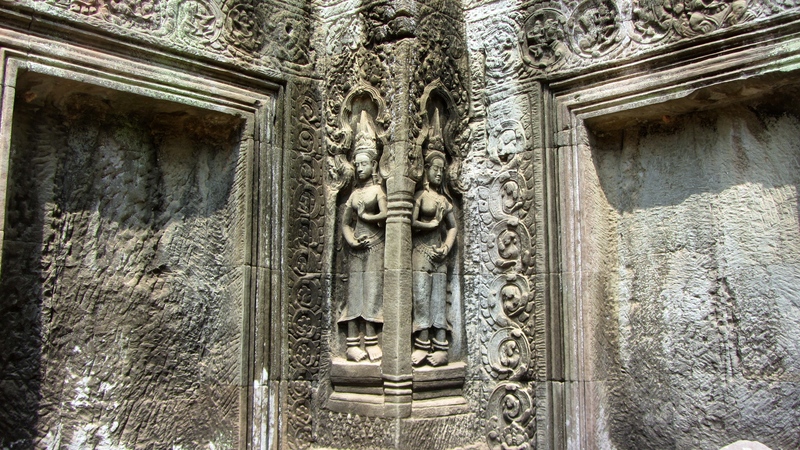 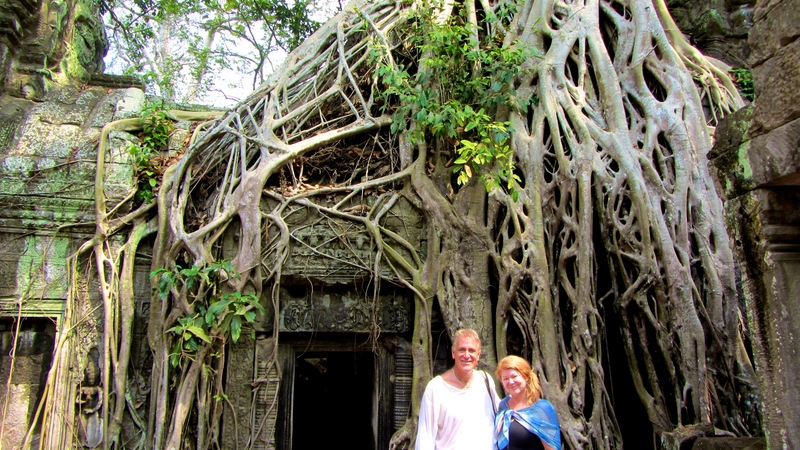 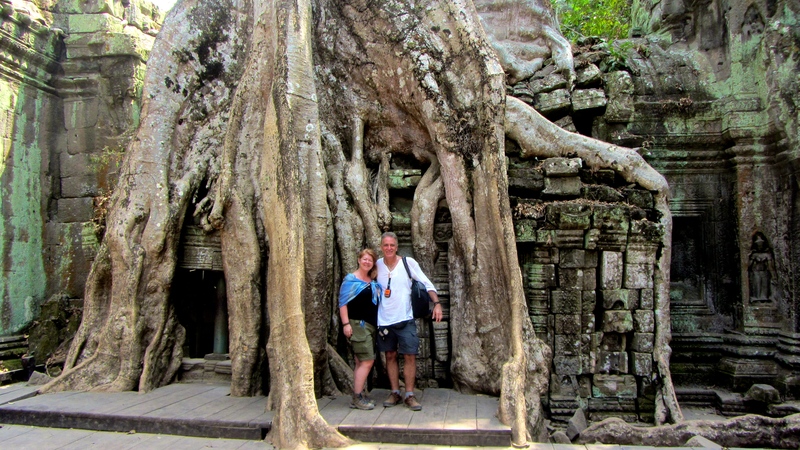 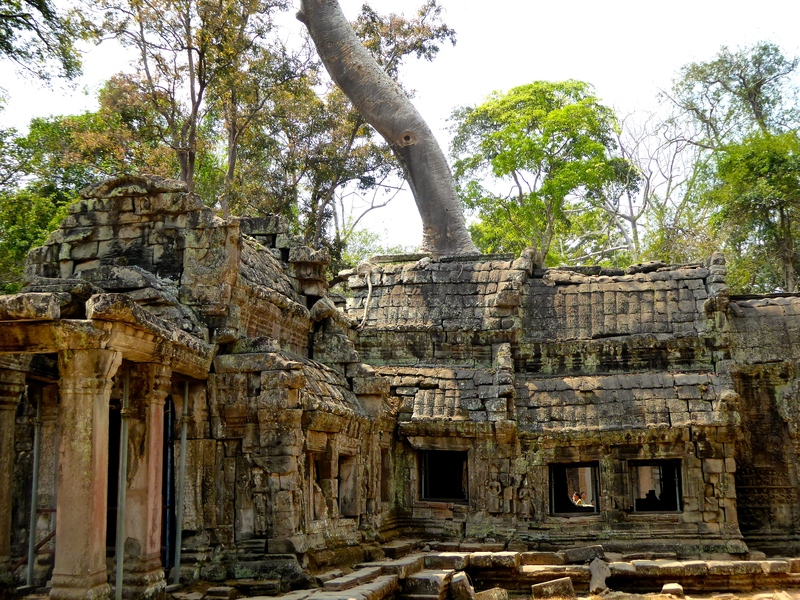 Within the park is another historic temple called Ta Prohm. 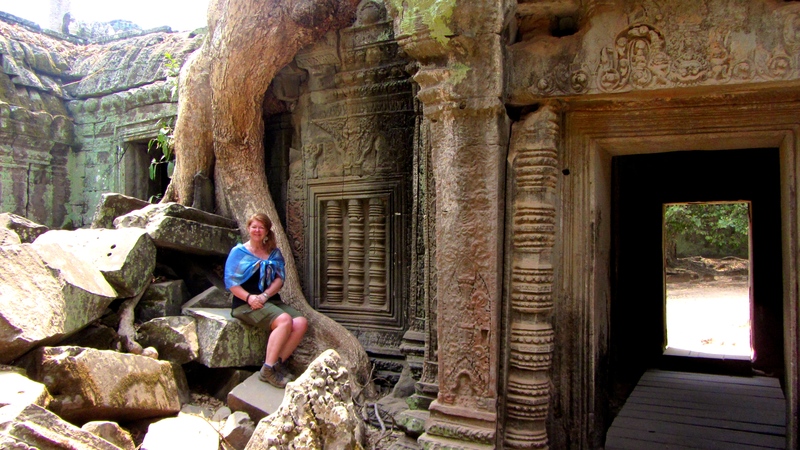 (http://en.wikipedia.org/wiki/Ta_Prohm) If you’ve seen the Tomb Raider movies with Angelina Jolie, you’ll recognize these ruins. 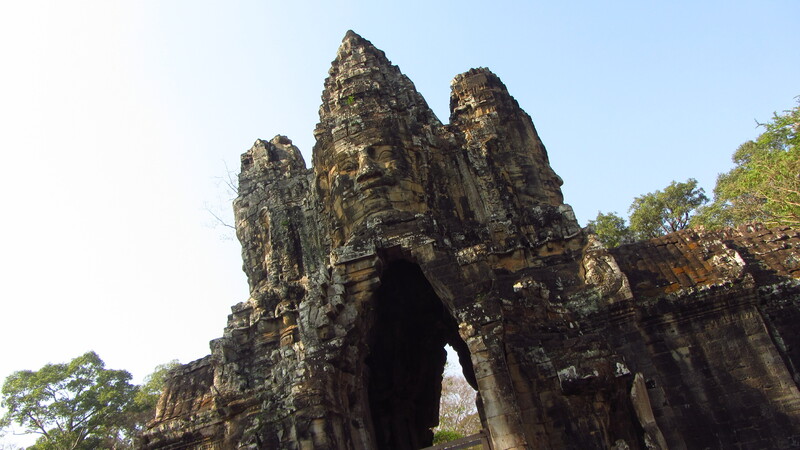 It is during this filming that she also fell in love with this country, adopting her son Maddox, and donating much of her time and money within Cambodia. 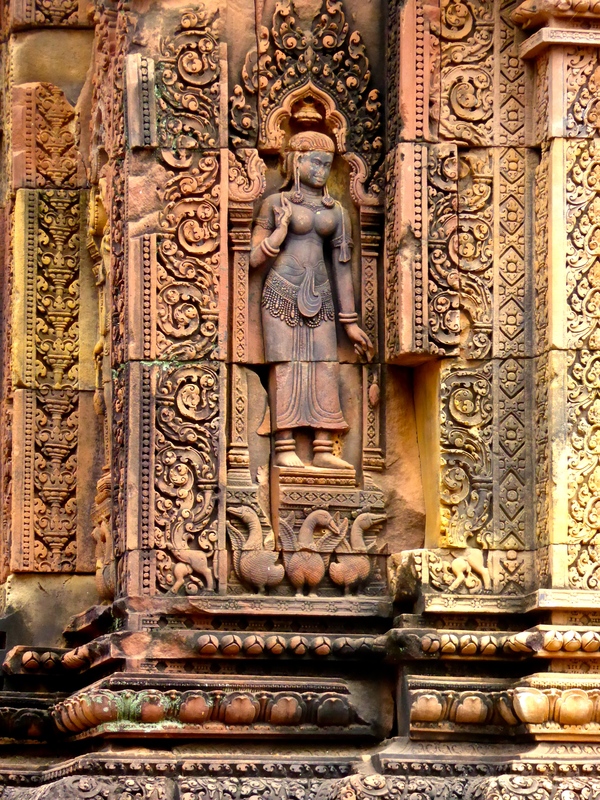 So much so that this temple is now nicknamed the “Angelina Jolie” temple. 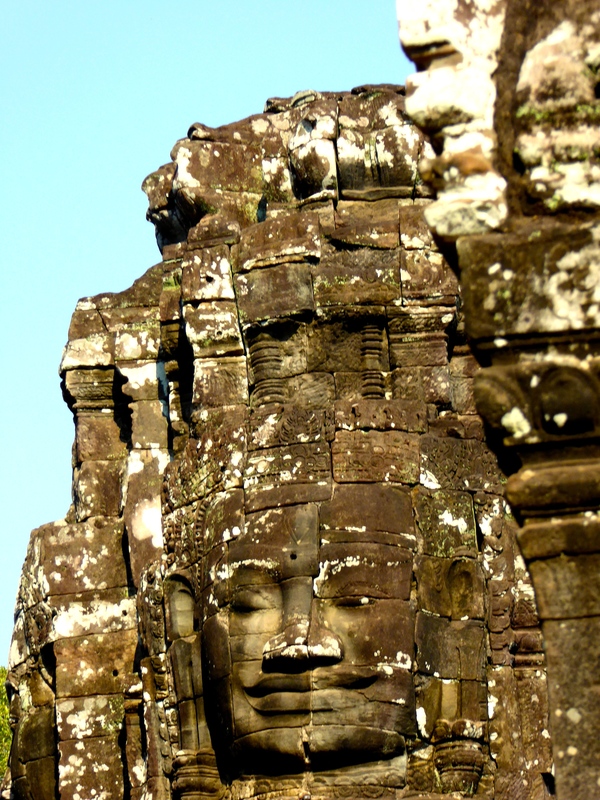 King Jayavarman VII built this temple in the late 12th / early 13th centuries in dedication to his mother. 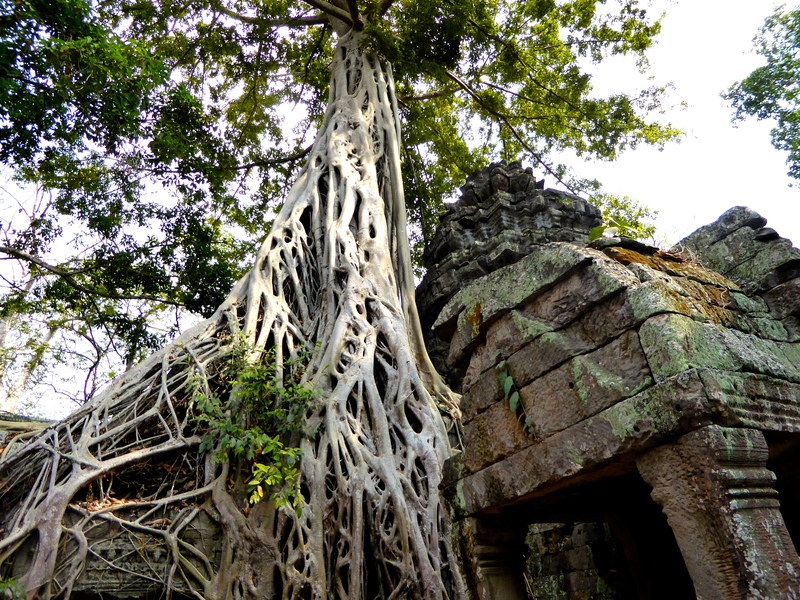 It was discovered in 1860 by a Frenchman – Henri Mouhot, and the jungle has intentionally been left mostly intact – almost the way he found it way back then. 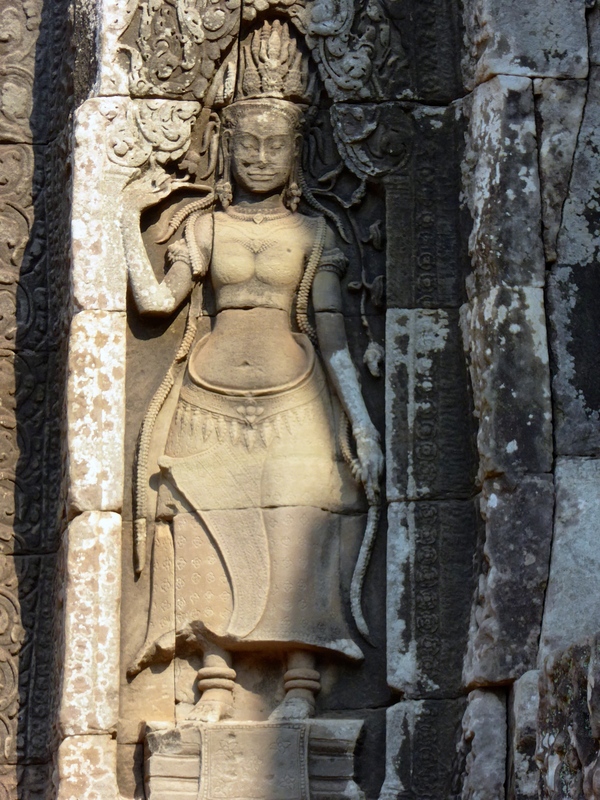 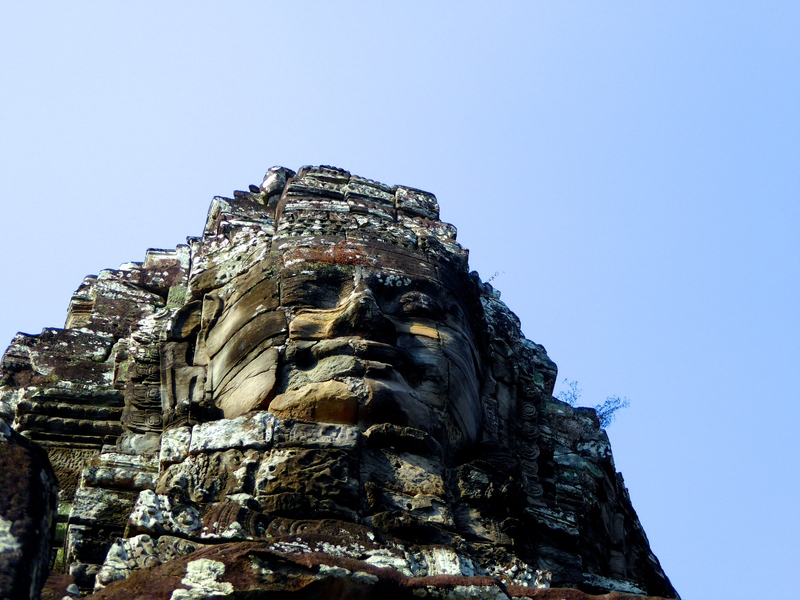 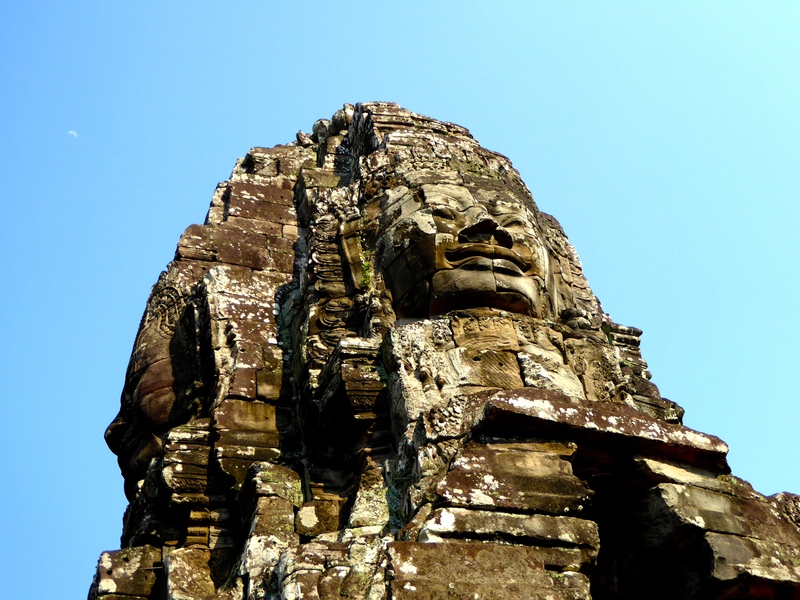 “The monastery was one of King Jayavarman VII’s first major temple projects, and was dedicated to his mother. 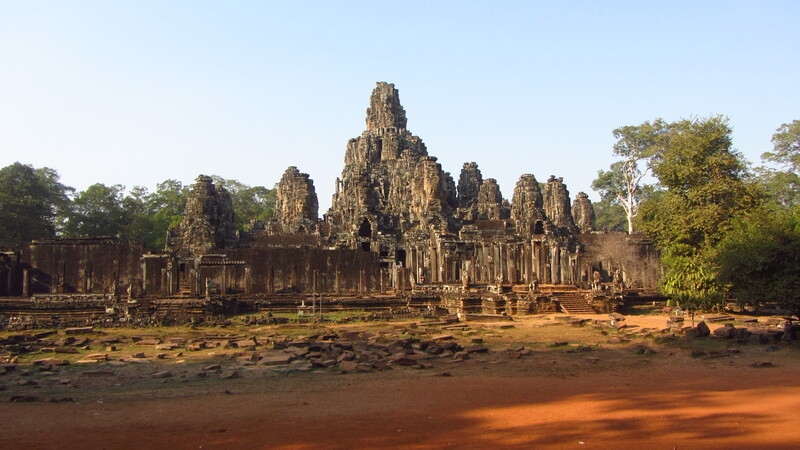 It is estimated that at one time this vast 600-room monastery and the surrounding area had a population of over 70,000 people. 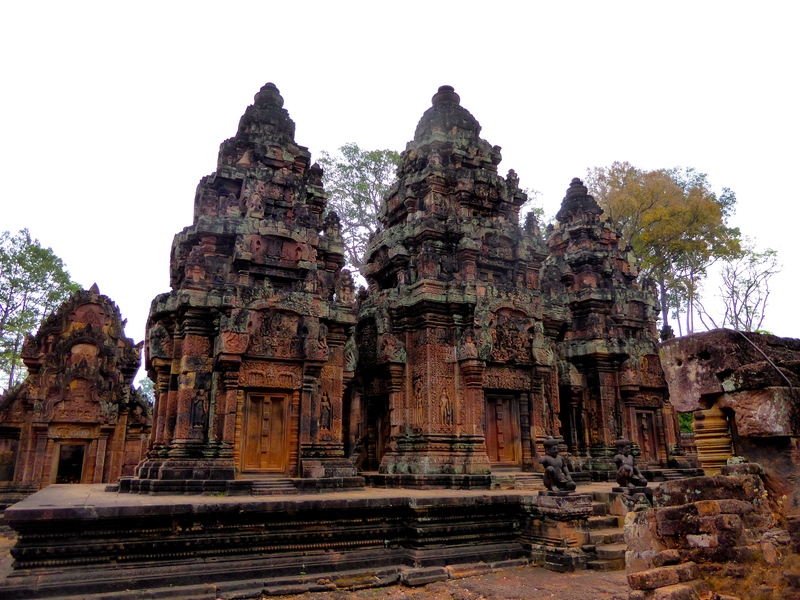 The temple is 145 metres by 125 metres, It was home to high priests, monks, assistants, dancers and laborers, and was very wealthy with great stores of jewels and gold, and controlled an estimated 3,000 villages.” Source: http://www.visit-mekong.com/cambodia/angkor-wat/ta-prohm-bayon.htm Great roots from giant jungle canopy trees have been left to grow within the rock carvings, creating an exquisite, completely natural landscape that is spectacular to photograph. 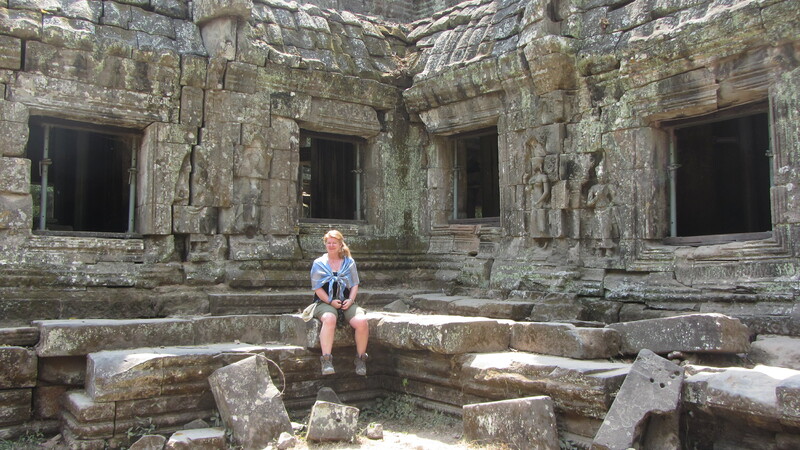 We were lucky to be there in the early afternoon, so there were very few tourists present…though the reason for this is that most tourists (wisely) try to avoid the intense mid-day heat!!! 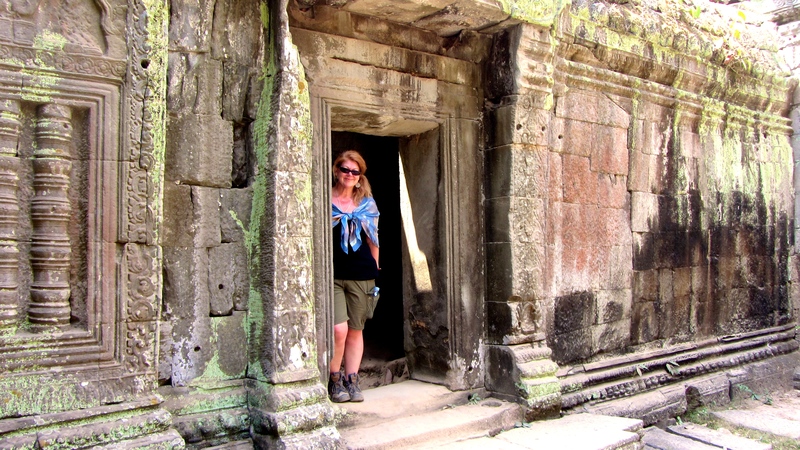 Some people recommend the services of a guide, as it’s easy to get lost within the many twists and turns within the hallways of these ruins, but everyone we asked gave directions to help us find our way out when we lost our bearings 🙂 There’s only 2 entry ways, so just in case you go out the wrong side, be sure to have the mobile # of your tuk-tuk or car driver so they can meet you at the other end if you get turned around … it’s a long hot walk back through the temple & you could easily get lost again! 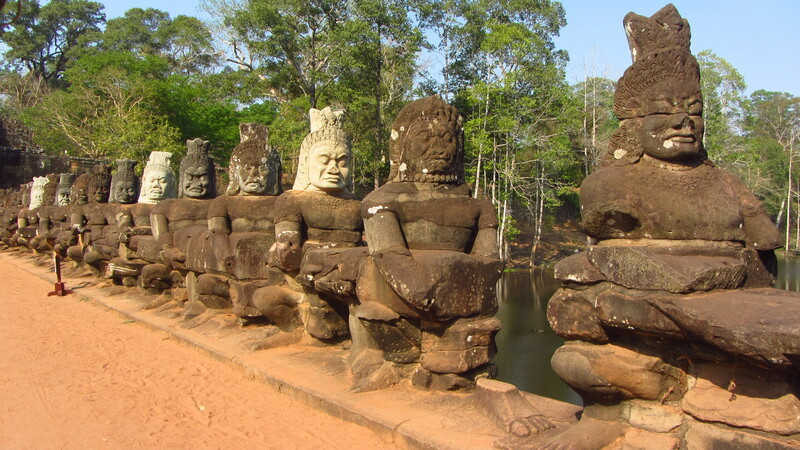 Banteay Srai is the final temple we visited in the Angkor park. 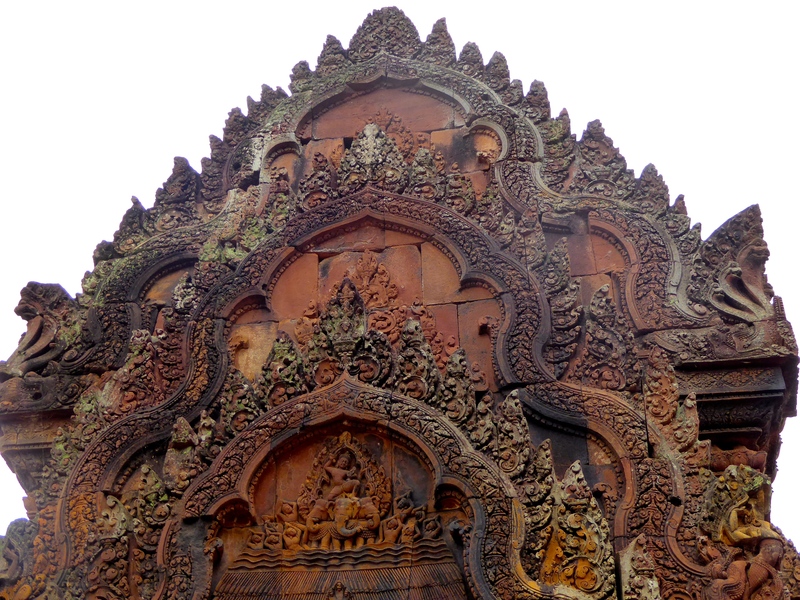 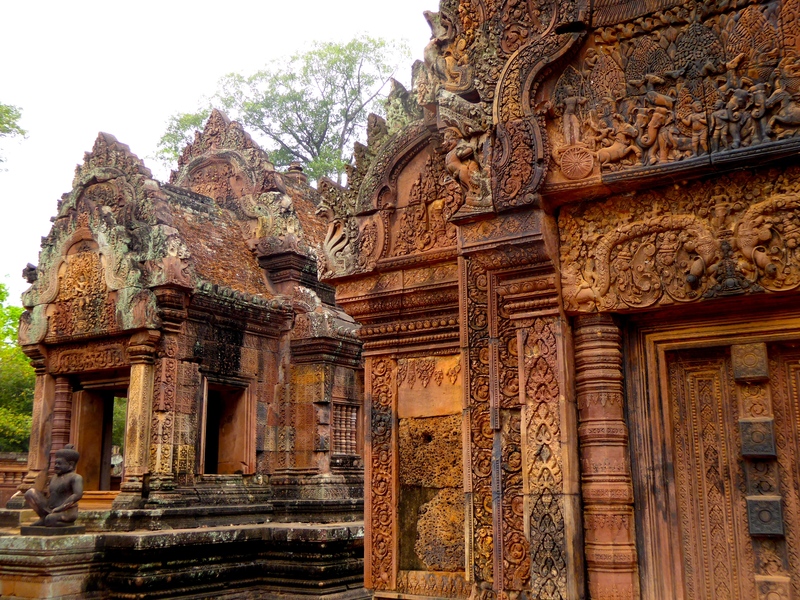 It’s often called the “Pink Temple” or the “Lady Temple” as it’s carved out of red sandstone. 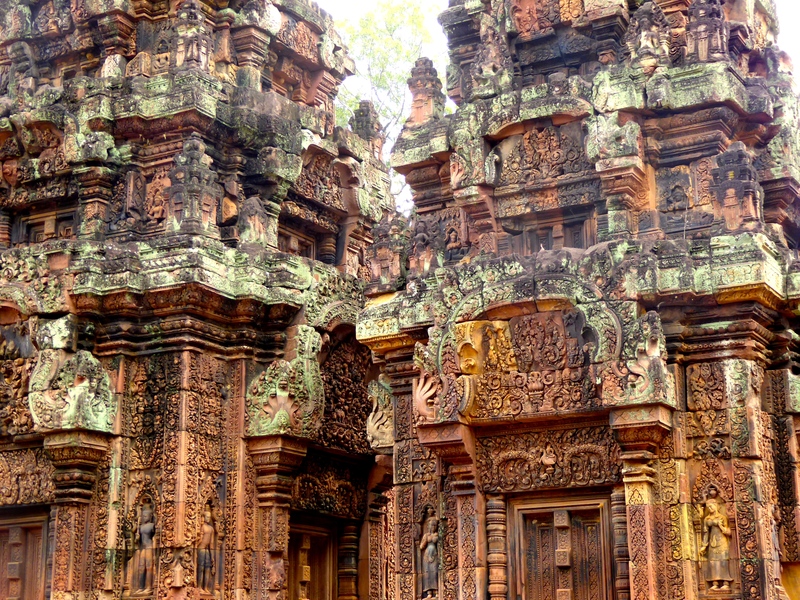 Built in the 10th century, it’s the smallest of the main temples, but definitely work a stop to admire the intricate carvings dedicated to the Hindu god Shiva (the Destroyer). 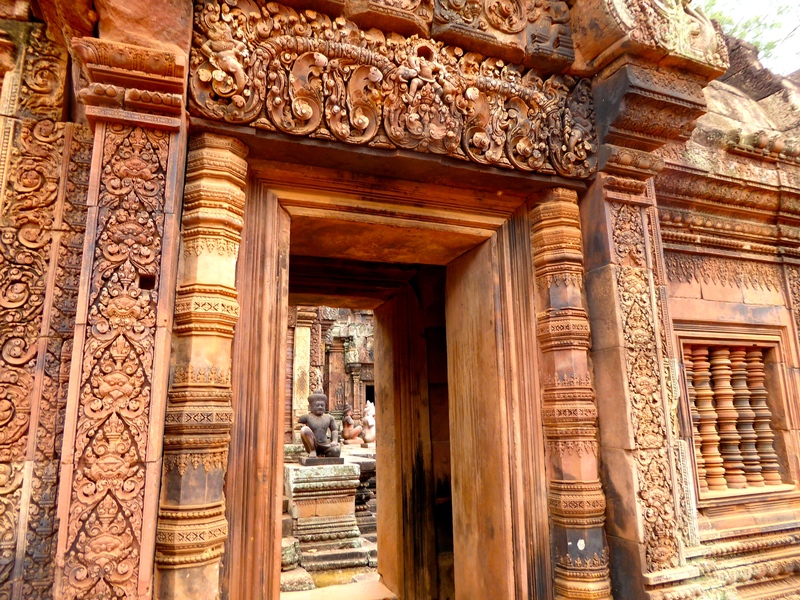 http://en.wikipedia.org/wiki/Banteay_Srei My travel partner has visited this temple many times over the past decade, and has noted that the vegetation and algae from the jungle have started to creep into the sandstone ruins, now causing it to appear darker from the green overgrowth. 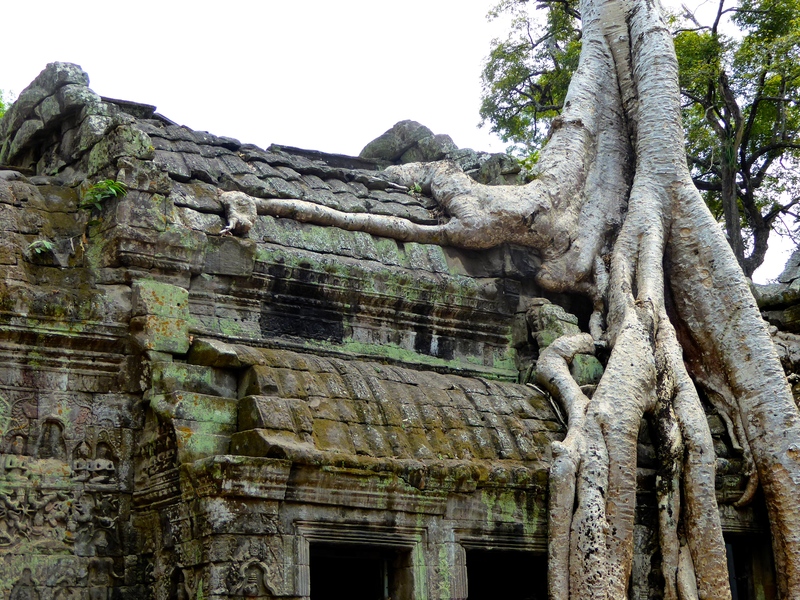 It looks like they need to invest time and money to correct this issue before the temple becomes overgrown by jungle, though the effect itself adds an interesting dimension to the beauty of the ruins. 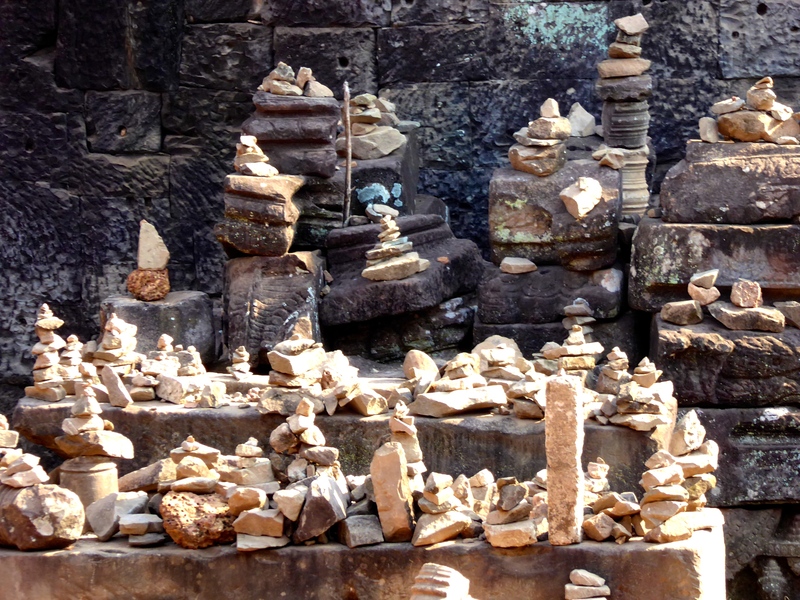 I hope you enjoy these final photos … Namaste!